Writing XML tags to import Journal Vouchers from Excel sheet into Tally. Shweta Softwares now provides live (real time) online training sessions to enable users to use its products more effectively and easily. ii) held at regular intervals. Manual reset for UDIMagic license shall be restricted to maximum 4 times per annum and 10 times in total (life-time).This shall be applicable to all UDIMagic users. In Windows XP, you can set permissions on files so that specific users can access it. However, in certain cases when you Right click on the file and select Properties, you may notice that the Security tab is missing. 1. Open Windows Explorer, and choose Folder Options from the Tools menu. 2. On the View tab, scroll to the bottom of the Advanced Settings and Clear (click) the check box next to "Use Simple File Sharing." 3. Click OK to apply the change, and you should now have a Security tab when viewing the properties of a file on an NTFS volume. In certain Excel templates, we use a sheet for specifying some Settings. Generally, this sheet is named as SETTINGS. However, at times you may forget to include the Settings sheet. Here's the macro code to check for the Settings sheet and display a message if it is NOT found. MsgBox "Error: Settings Sheet NOT Found! " +chr(13)+chr(13)+"A sheet named SETTINGS must exist in Excel file"+chr(13)+"Terminating application"
The aforesaid error Date is Out of Range occurs if the voucher date is lesser than the Books beginning date given in the Tally Company. We have found that the said problem generally arises in cases where the Excel data is generated from some 3rd party application. Though the data generated by that application may be in dd-mm-yyyy format, it appears as mm-dd-yyyy in the Excel sheet. To rectify this, use option "Start - Settings - Control Panel - Regional and Language Options" and set the option as "English (United Kingdom)" instead of "English (United States)". In case, if you are using Excel 2010 or Excel 2007 and get the Ole Error 800A3EC while importing data into Tally using UDIMagic, then it is likely that VBA is NOT installed in your system. The above replaces all occurrences of capital "A" with small "a" in the cString variable. The VBA Replace function is very useful for manipulating Excel data at runtime. In certain cases, where the Excel data is generated from 3rd party softwares, we faced certain issues. Example, the Amount was displayed in TEXT format and included comma separator like 1,50,000.00. We used the VBA Replace function to remove the commas and then convert the value to Numeric. 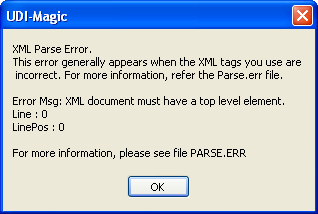 If you are using Excel 2007 or higher version and get the said error while importing data into Tally using UDIMagic, then it is likely due to Macros. In Excel 2007, the default setting for Recalculation of formulas is AUTOMATIC. We need to change it to MANUAL initially before making changes in the Excel sheet at run-time and the reset it to the Automatic at the end. The OFFSET Excel formula is quite useful when we need to access the values of previous or next rows. Returns the value of Cell A9. When you use the option "Gateway of Tally >>Price List" to enter Price Levels for an StockItem, if you specify the Rate in "Alternate Unit", the same is stored/saved but is NOT displayed when you once again modify/view it using the "Gateway of Tally >> Price List" option. The aforesaid error NO ACCOUNTING INFO generally occurs while importing data into Tally Software, if the LEDGERNAME tag is missing or does not contain any ledger-name. Here's a sample Template for Sales Vouchers with StockItems, VAT, Addl VAT. This format is based on requirement of a Landmark Honda Dealer. 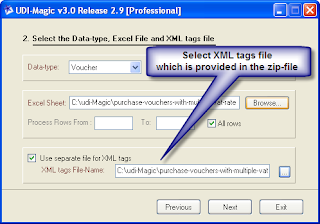 If you have download sample-templates from our site, please check whether the zip file contains XML-tags file.If it contains the xml-file, then you must specify the xml-file in the UDIMagic where you select the Excel sheet. Ensure that you tick the option Use separate file for XML tags. 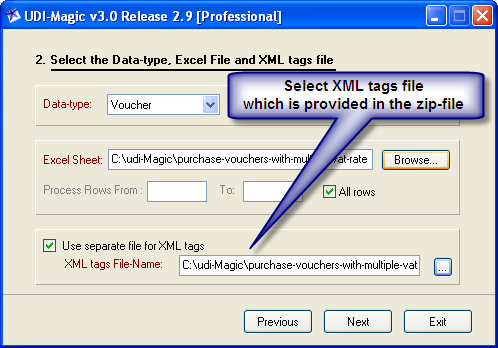 If the zip-file downloaded from site www.rtslink.com/download-excel-sheets.html contains xml-file, then you must select it in the UDIMagic dialog box else not. 1) Free upgradations for UDIMagic Software shall be provided for a period of 90 days. a) This policy is being followed by Shweta Softwares from the very beginning. b) Minor upgrades are provided free-of-cost even after 90 days. 2) Support Services shall be provided for a period of 90 days. b) After 90 days, Customers need to go for AMC which shall be appx 30% of the Software charges. Alternatively, support services can be availed on per-call (remote-support-call) basis also. The INDIRECT worksheet function is a useful tool for creating cell or range references "on the fly", as a formula is evaluated, rather than "hard coding" them into the formula.